When I think mushroom risotto, I think heavy, luxurious, decadent food. I think hanger steak and red wine. Or maybe I think about sausage and red peppers, and good old fashioned comfort food. I definitely don’t think about our January non-resolution to eat healthier and try to be more reserved. But really, when you think about, why not? First – one of my favorite food/wine pairings is white wine and mushrooms. A good white burgundy, say from Beaune, or even an oaky chardonnay from California- it all goes really well with mushrooms. So, if white wine goes with mushrooms, shouldn’t some of those flavor profiles carry over to the rest of the dish? Which brings me to my second point: although fish is certainly healthier than steak, it’s still a decadent and delicious meal. It’s taking things one step healthier, but it’s not like we’re pairing this rich mushroom risotto with a raw carrot salad. 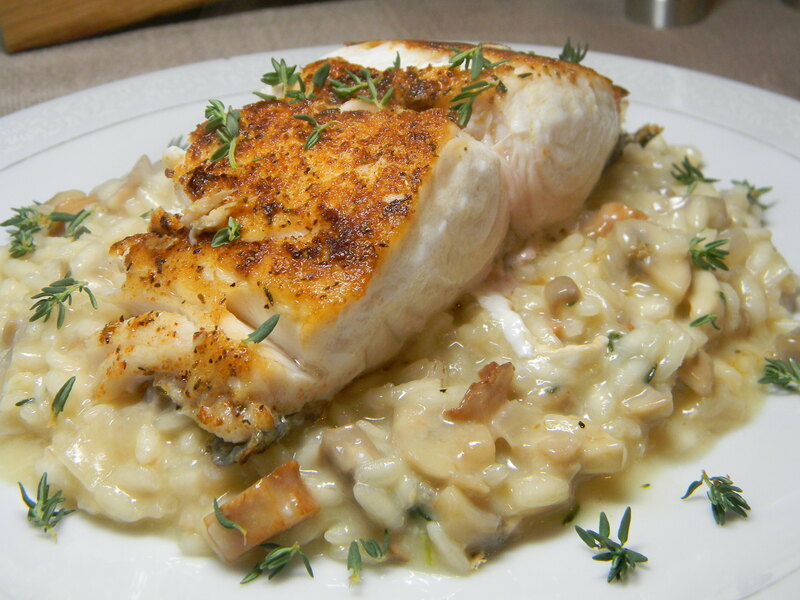 There’s a ton of flavor and umpf in this white, flaky escolar fillet.